If your car breaks down in Henderson, NV, just one call to Henderson Mobile Auto Repair is all that’s needed. We take care of the rest so you can go back to what you were doing before your life was interrupted. Stop in today or contact us for more information! Welcome to Henderson Mobile Auto Repair, in Henderson, NV, one of the most trusted and respected automotive repair facilities in Henderson, NV, and surrounding areas. We embody a standard of quality based on reputation, integrity, qualifications and expertise. Henderson Mobile Auto Repair is a full-service auto repair facility servicing all Domestic and Foreign Cars and Light Trucks. Not only will we take care of all your vehicle needs, but do it with professionalism and a level of customer satisfaction second to none. The certified auto repair worry-free nationwide warranty has you covered - no matter where your travels take you. Restore your vehicle to its original operating condition by having your vehicle inspected by Henderson Mobile Auto Repair today! 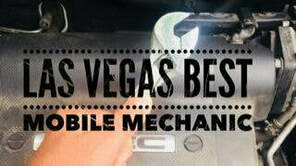 Call us right away at Henderson Mobile Mechanic: 702-602-7656 and we will be right there. Really happy with this service. Got a great deal on our first appointment with the 20% off deal. But best thing was hanging out with Aron and just knowing what work was being done and knowing it was guaranteed."